Creating Beatiful Locks is about embracing heritage, not dogmatic rules and methods. The art of locking is about listening to the hair and hearing the needs of the hair, then partnering this knowledge with the biological state of the hair and lifestyle choice. Time and time again, those who adorned their heads with locks have turned this albatross of shame into a crown of glory, embracing the power of the kink as it emerges from an intricate pattern into a matted chord of hair. Creating Beautiful Locks can have many ups and downs that are necessary for a head of healthy locks to form. The mental transition of seeing the beauty of the evolution, pushing the envelope of accepted and established visages of beauty, can occur in the midst of the locking journey, if you let it. This will not only challenge those witnessing the evolution, but the locker's value system will be challenged to accept a new medium of beautiful. The locking process is fascinating and it can be beautiful to witness what the dead material of hair will do when left alone. When allowed to thrive and grow, unadulterated, locks take on a life form and personality, of their own, that can direct the locker into submission, establishing a new standard of beauty. 1. Do not over use any product. Locks like to be clean, free of excessive product build up and neat. Remember, locks are meshed matrix/net of hair that capture everything; and, it's important to be able to reach the inside of the lock for proper cleaning, as well as outside. That's difficult to do if the locks are building a foundation clouded in product build up. Excessive product use (of the wrong product) can also lead to breakage. Moderate amounts are all you need of any product. 2. Always tighten the base of the lock in the same direction. Whether locks are tightened with a tool or twisted/palm-rolled, it's essential that copious notes are kept that explain the direction of the rotation. Keep a lock chart. Locking in the same direction insures that that the locks remain strong, without compromising the integrity of the locks, leading to breakage later on from the friction of going in different directions. 3. Never overtighten the base of locks. It's important to wait 4-6 weeks between tightenings. Learn to embrace your locking process. It's key . The roots are not always going to be pristine, neat and 'tight'. You gotta bud, frizz, drop hair balls, condense, puff up and shrink before ya lock. It get's quite messy before beautiful locks emerge. So embrace this part of the process. In addition, waiting allows the base of the lock to thicken and grow, contributing to a strong lock foundation. 4. Dont be a Product Junkie(PJ). When it comes to locks, less is best. Unlike loose natural hair that loves products with slip and creamy conditioners that smell lovely, locks dont. It's important for locks to mesh, matt and tangle. Products with wonderful slip, creamy consistencies and yummy smells can not only leave residue inside of a lock, leading to mildew and unsanitary conditions, but the perfumes usually have alchols in the ingredients, that can get trapped inside the matrix of the lock, leading to weak locks that break. Further more the detangling nature of the products with slip could result in locks that unravel, instead of lock. 5. 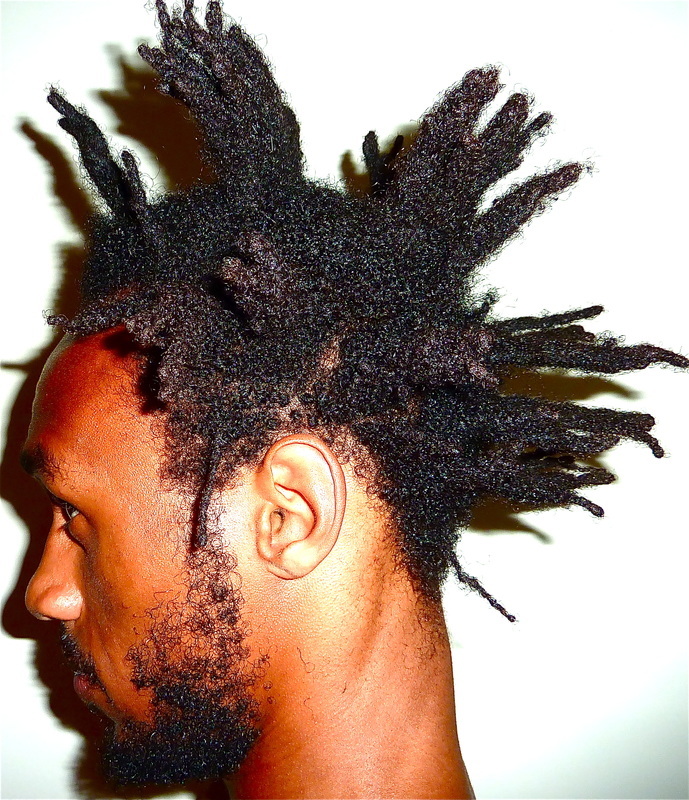 Don't Starve your Locks! What do I mean? Often there are two extremes with lockers. Some over use product and others underuse product. When locks feel dry like straw, and the scalp is flaking of dandruff, that's a pretty good indication that it's time to feed your locks. The type of products locks loves consist of botanical ingredients and essential oils such as clear, plant based oils like jojoba and olive oil. Essential oils can complement the botanical oil in a ration of 1 drop per 1 oz-no more! Which oils to use are a matter of preference and health of the locker. Research which one works for you. 6. Don't use thick, creamy products such as beeswax, shea butter and creamy conditioners. I can't say enough about this. If these products are used on locks, you will experience build up. Maybe not the first year of locking, or the second, but right when you think you have the whole locking thing down to a science, cruising in year 4/5 you may begin to notice a sour smell in your locks and see some white, guey particles 'stuck' in your locks, usually from the middle of the lock shaft towards the ends of the lock. Overtime, the locks will manifest a grey film visible on the outside of the lock, penetrating into the inner core of the lock. It's beyond difficult to get out of the locks. There are options that take alot of time and alot of washing and rewashing. Stay clear of these products with your locks and keep it clean and clear. 7. Stay away from shampoo with SLS/SLES. Just google it. In short, it's scientific shorthand for a surfactant found in everything from dish washing soap to bar soap, shampoo soap and anything that suds. Discovered at the turn of the 20th century, it was used successfully to remove dirt and grime for those working in factories laden with grease. This ingredient works up a lather and is usually affiliated with cleanliness. Unfortunately, SLS/SLES can be drying to the hair and harmful to the enviornonment and often is accompanied by DEA/MEA (look it up).These ingredients can combine with other chemicals in the body, leading to cancer (Niculescu et al. 2007), while SLS/SLES is linked to blindness and leaves residue on the hair, which can further weaken the hair cuticle (Neppelburg, 2007). If you are experiencing dryness with your locks, read the back of the bottle of your favorite shampoo and see what you're getting. Instead, opt to wash your hair with botanical shampoos and soap bars that are glycerine based, found in most health food stores and online. 8. Remember to POP those roots! Unless you plan to free form, when roots are free to grow in organically, free of manipulation, you want to copiously separate the roots after each cleansing session, or whenever the locks are dampened with moisture. Locks love to 'stick' together and will begin to join the adjoining lock, meshing into a net of tangles. Gently spritz and pull the root-base apart, gently! 9. Don't' play around with color. I am all about empowering others to grown their own locks; however, when it comes to color, leave this area to the professionals. There are caustic ingredients in all synthetic coloring agents that have biological implications, no matter who applies it, so when it comes to this area, leave it to a trained professional. Some may choose to entertain the use of hennas on the hair. Be careful. Low-grade hennas can be extremely damaging to locks and any henna can lodge particles in the locks, that slowly degredade the hair, leaving shattered locks two to three years post application. Leave this to the professionals or read The Knotty Truth Comprehensive Lock Manual to discover alternatives such as herbal teas to slowly change the hair color over time. 10. Don't have lock envy! This is key. This is your journey. Each hair on your head is unique, each strand individually yours; therefore, your locks will not look like anyone else's locks. They will look like your own unique set of locks. They will grow differently. They will bud differently. They will frizz differently. They will expand differently. The first year is the most dynamic year of locking. Watched pots don't boil. Enjoy your babies. They will be grown before you know it. ​For recipes and ingredients, more on what ingredients to avoid to have a successful locking journey, and more Dreadful Mistakes you want to avoid, get your copy of The Knotty Truth Creating Beautiful Locks on a Dime: The Comprehensive Lock Manual, Today!